A metal grid, composed of beams and cross tees, that hangs from the ceiling and supports acoustical panels or tiles. In the United States, suspension grid cells are usually 2 ft.×2 ft. or 2 ft.x4 ft. 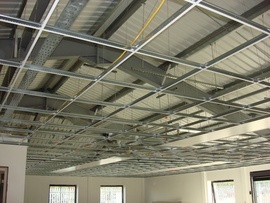 Suspension systems for dropped ceilings generally run $2 per square foot.